Dead Spot caused by Ophiosphaerella argostis is a disease of young stands of bentgrass and Bermuda grass that occurs most frequently in high sand content areas. It has not been observed in native soils. Dead spot is most severe in turf grown in full sun, areas prone to summer stress, and low-cut greens. It is less severe in higher-cut collars and tees. Dead spot generally occurs within 6 years of seeding or sprigging a new green and on greens that have been fumigated with soil sterilants. Disease intensity may lessen with time. 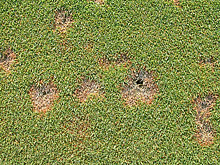 Initial symptoms consist of small, reddish brown spots which resemble ballmarks. As the disease progresses, spot centers turn tan with reddish brown margins. Roots and crowns of affected plants are dark and necrotic. The spots can be slow to recover as stolon growth into affected areas is inhibited. O. argostis survives the winter in crowns, stolons, and roots as pseudothecia. The fungus becomes active when temperatures reach 68 ºF (20 ºC) for several days and attacks all turfgrass tissues. In bentgrasses, the disease may be active from May-December, but it is most active in hot, dry weather. The optimum temperature for the pathogen is higher than temperatures favorable for the growth of cool season turfgrasses. It is important to achieve complete recovery of the spots before winter. If an outbreak is limited, affected spots can be plugged out and discarded. The use of ammonium sulfate may lessen disease severity, while urea or nitrate forms of nitrogen favor reoccurrence in subsequent years. Maintain a soil pH of 5.5 if ammonium nitrogen is not used. Avoid topdressing material with a pH greater than 6.0. Lime applications may intensify Dead spot. Minimize soil compaction and thatch accumulation which suppress root growth. Maintain good soil drainage which promotes good root development. Adequate potassium fertilization is important to the turf's disease resistance. An aggressive aerification program in the summer reduces disease pressure, as long as environmental conditions are conducive to turf recovery. An appropriate fungicide mixed with a low rate of nitrogen arrests disease development and speeds recovery. Weekly fungicide applications may be required until full recovery is achieved. Control of this disease with fungicides is often not consistent; however fungicides may improve turf survival enough to allow regrowth into affected spots. For a listing of fungicides currently labeled to manage this disease, refer to the Disease Management chapter of UMass Extension's Professional Guide for IPM in Turf for Massachusetts.